Explanation: The North Pole of Mars is capped by layers likely consisting of ice and dust deposited over millions of years. 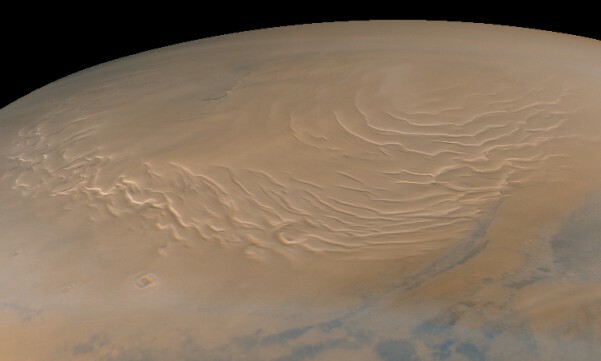 Imaged on September 12 - early Spring for Northern Mars - by the Mars Global Surveyor's camera, this synthesized wide-angle color view shows the rippled, eroded polar terrain covered with pinkish seasonal carbon dioxide frost. Dark areas bordering the polar cap are fields of sand dunes. This is the last picture scheduled to be taken by Surveyor's camera until it resumes operation in late March 1999. Over the past year of operation, the camera has taken about 2,000 pictures of Mars. Meanwhile, the spacecraft will begin its second round of aerobraking to achieve a circularized martian mapping orbit.